They say the better part of travelling is meeting the people from the countries you visit. They do not say how much that meeting will affect you, neither how heartbreaking such encounters can be. The first time I met a one legged man in Laos, while visiting COPE – the charity for the war injured, I asked him how he lost his leg? “The American’s took it,” he replied. Such emotionally confronting sights are common in South East Asia if you let yourself see them. Too many of the people who come here simply gloss over the lives of the people they encounter. Too many go home and say, “Oh South East Asia is alright, beautiful countryside… but so many beggars!” Without giving any thought to what this means and what causes people to beg on the streets. Beg, not because they want money for a drug addiction, simply because there is no governmental help for the war-wounded and having no legs, fingers or arms is a lifelong barrier to entry to almost anywhere. We have spent the last three months travelling all over SEA with our eyes wide open. In fact, we decided to go all the way and visited all the disabled workshops, children’s orphanages and museums that we could. We have met with Cambodians missing limbs, Children Orphaned by AID’s, Vietnamese who fought against the US and Laotians struggling to come to terms with their ravaged country. Along the way, we have visited many of the actual areas attacked by or affected by the war, spoken with war photographers who captured the images that define the war and run our hands over the pockmarked remains of war equipment. This is not very hard to do. 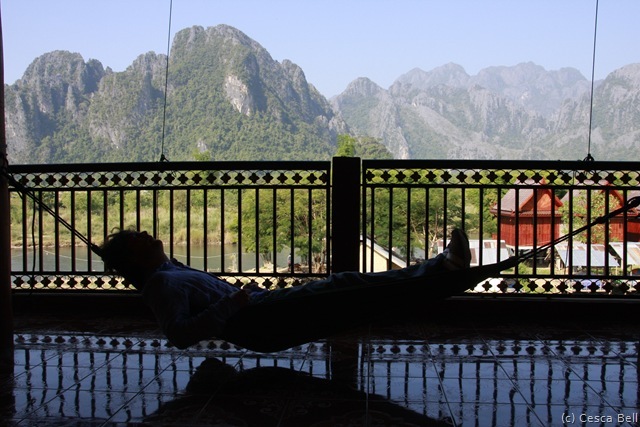 Simply visit Laos, Cambodia or Vietnam and you cannot help but see if you only look. However, the results are not pretty. Through all this I have held off commenting on the war, known to those in Vietnam as “The American War,” until I actually left the area. This is because millions of people in South East Asia are still feeling the effects of the conflict everyday and by being there I was in danger of missing perspective on the big-picture. I wanted to be far enough away from it all to be able to get some context before I commented. That is why this blog entry exists. We left the area in February, bound for India, and after much discussion between us, I feel I can properly write about the American War. Everyone knows about the war in Vietnam, right? Wrong. 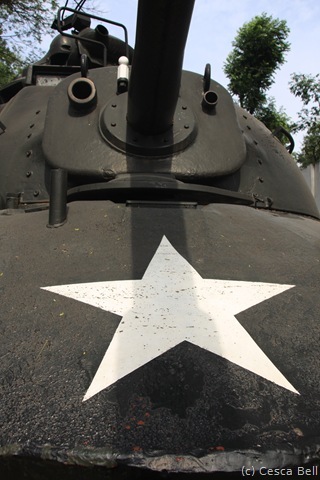 Before coming here, 90% of the information I had about the Vietnam War was created by the US movie industry. I grew up watching Platoon, Hamburger Hill and The Deer Hunter. 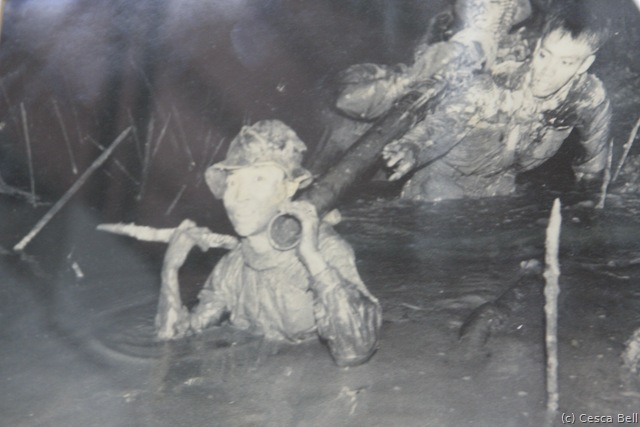 To me the Vietnamese were slant-eyed nightmares who charged the noble US grunts fighting for freedom in the jungle. Before I left home, I had neither any idea where Laos was nor had I known the tragic history of Cambodia (all I knew was that it didn’t look like Kansas). If you are in the same situation, here is a quick outline of what actually happened in easy to understand steps. Please keep in mind that while I do have some qualifications as a historian, I have not attempted to be definitive here in any sense other than intentions. Some of the numbers happened at the same time and some may be out of order. I have linked all my sources in the endnotes of the article. 1. The French took over a lot of SEA apart from Malaysia, which was British owned thanks to a British adventurer who had his balls shot off. 2. The Japanese invaded in WWII and “kicked them all out”. 3. The British, US (via sea), Australasians’ and free people of SEA defeated the Japanese. 4. The French tried to get their empire back. 5. They were defeated by the Vietnamese in battle. 6. Meanwhile the Chinese went communist. 7. The US invented the idea that since China was next to the USSR and SEA was next to China, a dangerous “Domino Effect” might spread Communism as far south as taking over Australia. This shows a mighty misunderstanding of the Australian temperament. 8. 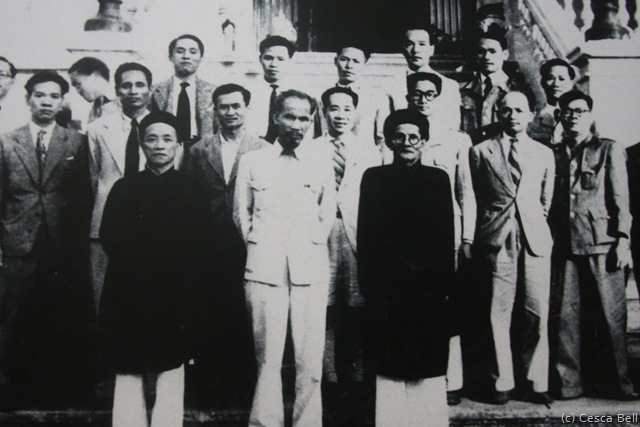 Ho Chi Min declares his country separate and his view communist. 9. The King of Cambodia declares his leanings communist after a long visit to China. 10. All parties agreed to avoid war or get involved. 11. 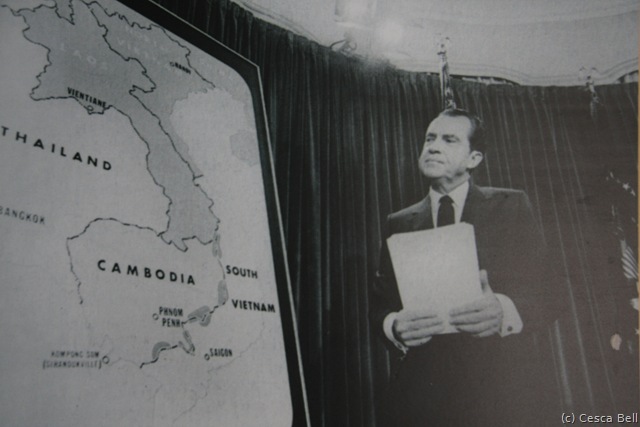 All parties ignored this agreement and the US started “advising” South Vietnam. 12. The South Vietnam regime is blood thirsty and even uses the guillotine. Much like the reports of the North then. 13. 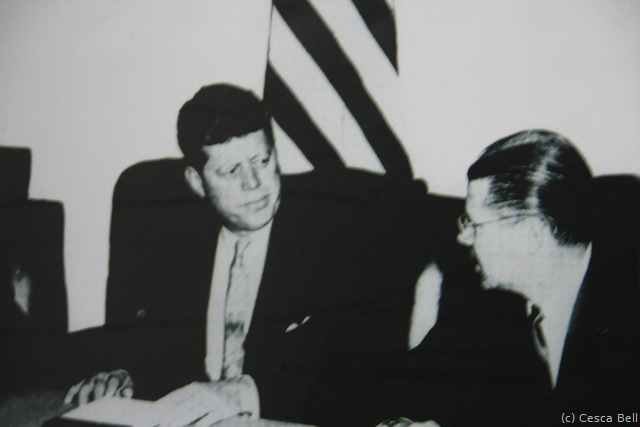 The South Vietnam leader is assassinated, which shocked Kennedy. 15. The US either engineer, or allows to happen, the Gulf of Tonkin incident securing a declaration of war. 16. The US strategy in the war is similar to the “Shock and Awe” tactic used in the 2nd Gulf War. They believe that the communists will eventually quit. Thus, it becomes a war of attrition. This later proved a wrong move (see endnotes). 18. The Laos army tries to stop this and the Vietnamese start a revolution/uprising/civil-war in Laos. 19. Laos’ king asks the US to help after being left somewhat in the lurch by the French. They start a secret CIA led war in Laos by using the highland Hmong tribes as soldiers supported by the US airforce (directed by the famous Ravens). This war is against the Pathet Lao communists supplied by the Vietnamese. 20. 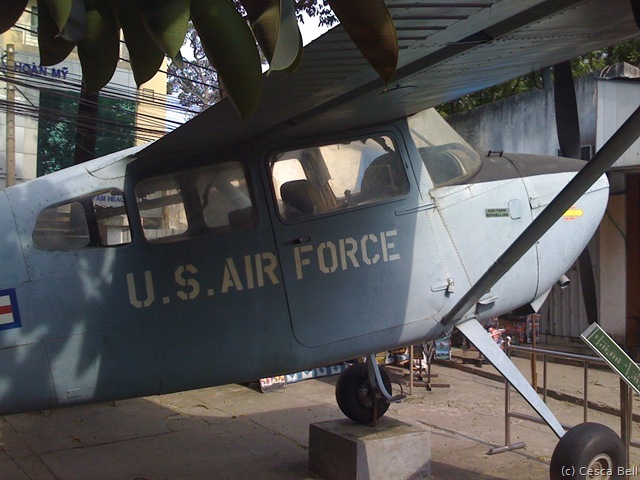 The US uses most of their airforce in Laos to bomb the HCM Trail. In fact, the bomb they crap out of it with cluster bombs, high explosives, soap and anything else they can think of. Nothing works to stem the flow and many of the bombs do not explode. The rest they use against the Pathet Lao around the Plain of Jars. 21. 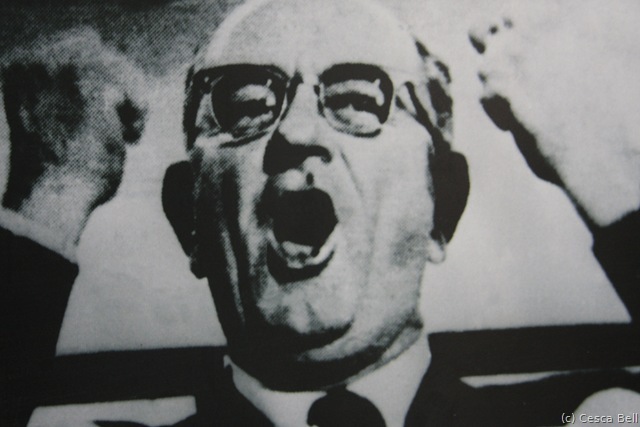 The US government says to the people that the war will soon be won; the communists are weakened and cannot fight anymore. 22. In reality the communists threaten the Khe San base to such an extent the US commanders plan on using short range nukes to defend it. 23. The Khe San offensive turns out to be a ruse by the Vietnamese and they have been secretly digging tunnels to Saigon (the Cu Chi tunnels). On the eve of the Tet celebrations (New Year – around mid Jan) the Vietnamese attack everywhere from these tunnels. 24. These resulting battles are all won by the US, but the public realise that they have been lied to and the US have to pull out. 25. Without US support Vietnam falls to the HCM forces. 26. Laos falls to the Pathet Lao and the Hmong are all killed or flee around the world. Many now live in the US. Some, amazingly, still live in the Laos hills avoiding the Laotian army. 27. Cambodia is in civil war at this point and the communist Khmer Rouge win the conflict in many ways thanks to the king (who is still in China) publically supporting them. 28. The Thai / Cambodian border is mined. A lot. 29. The Khmer Rouge move into the capital of Cambodia amid celebrations, but they have another agenda. They announce that all the people must leave the city immediately. Anyone who argues is shot on the spot. Those hiding in the French embassy are forced to leave and shot. 30. The Khmer Rouge forces the people of the cities of Cambodia to work in the fields as farmers. Anyone who argues is shot. 31. The Khmer Rouge leader starts rounding up people who do not fit his plans, basically educated people. Has them all seriously tortured and then taken out to fields and beaten around the head until dead. This is a staggering amount of people. 32. The Khmer Rouge then tries to take over Southern Vietnam. 33. The Vietnamese invade Cambodia, knock over the Khmer Rouge in two weeks and turn Cambodia into a vassal state only allowed to buy products from the Vietnamese (much like Laos then). 34. Thousands of Laotians start to die from Unexploded US Ordinances (UXO’s) every year. 35. Thousands of Cambodians step on land mines every year. 36. Thousands of Vietnamese start developing strange symptoms and having children with very serious birth defects. This is traced to “Agent Orange” that the US dropped on the jungles of Vietnam. “Agent Orange” contains some of the worst ingredients imaginable. Top of the list is Dioxin – look it up. Its claimed effect was to defoliate the areas hiding VC troops (Chu Chi for example), but the ingredients basically kill all life, not just trees. 37. Australia does not become communist. That is the basics. There is much more to it than that, but this is enough for you to be going on with. What is clear from the history of the area is that the US hates Communism. Hates it to such an extent that they almost nuked the country they were trying to defend to stop it. That’s some hate. What is so wrong with Communism? Well, nothing in particular, but it is essentially a people supposedly without rich and poor. Equality. Which doesn’t seem so bad until you realise how screwed up some of the attempts to implement the idea have been. Take Cambodia. There, the Khmer Rouge were inspired by Maoist Communism and yet decided that it was not going far enough. They tried to force the entire Cambodian people back into a simple farming life, a basic existence, by shooting anyone who said anything against it. Alternatively, take Laos, the Pathet Lao won the war and changed the country forever. Consequently, Laos is one of the world’s poorest countries; it has elections but only one party is on the ballot. The issue is not so much that a share-alike egalitarian culture is a bad idea, only that it has not been successfully implemented yet (Kerala in India not withstanding- it’s only a state). To the US though, it is more than this. The US is essentially designed as a country that rewards striving for wealth. The idea that a man is due the full value of his work in the pursuit of happiness. This is the “American Dream.” What it leads to is a country split between those who have and those who have not. Those who have: have a lot, and those who have not: have bugger all. The government is highly influenced by those who have and they were not about to give it all up to those who have not, right!? Bingo. The people who have won the “American Dream” deeply fear to lose their cut of the world’s profit. This fear underpins almost all US aggression around the world. The rest is just marketing; the picking of a bogyman and sticking it to him. The aftermath of the American War is the greater tragedy. 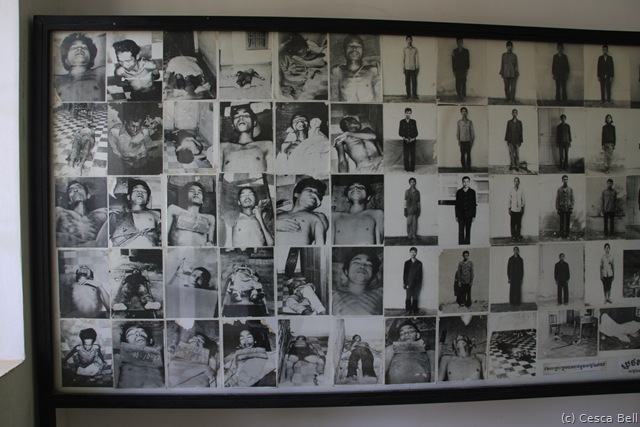 The Khmer Rouge was one of the most bloodthirsty murdering governments in history. One really has to get Biblical to match them. Would such a group have prevailed if not for the war? This is perhaps something that no one could have predicted. However, their legacy is still with us today; anyone over 35 in Cambodia lived through the Khmer Rouge government. That in itself is an achievement and the scars are everywhere. There is honestly something in the eyes, something in the attitude of Cambodians, which is not yet healed; the entire country is still emotionally broken. Mostly, this is due to the lack of justice done on the Khmer leaders. Pol Pot died under house arrest escaping a trial, and even the man who ran the Tuol Sleng Centre (also known as S-21) has not been tried yet. The ringleaders of the Khmer Rouge are all dying of old age before being judged. Its not that putting octogenarians into jail is going to protect anyone, but the country needs to judge these people as wrong. Only then can the healing begin. So what’s stopping it? 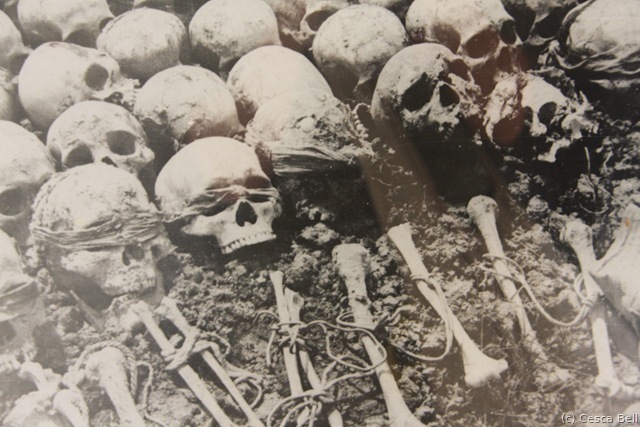 The Khmer Rouge have simply faded into a new skin: that of the Communist Party. The trials are therefore all being held up and so justice and healing for the Cambodian people is still a long way off. When visiting Cambodia, a number of things tug at your heartstrings. That is, after they are through tugging your arms. The whole country is awash with children who are forced to work. In many cases this is a genuine need for the family to supplement its income, but it does not change the fact that these children are everywhere. Everywhere but school. The second thing also tugs at you. At your ankles. 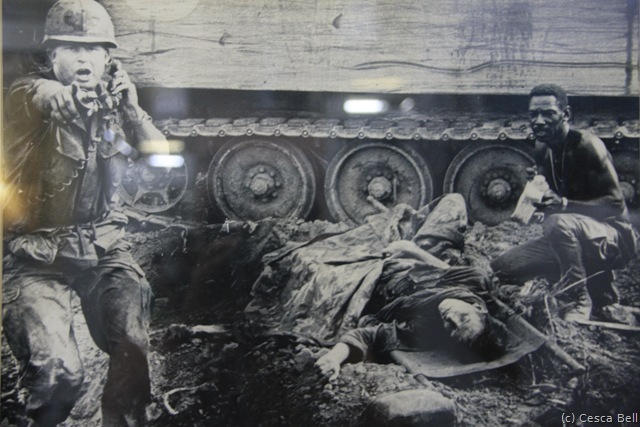 So many people have lost limbs through stepping on mines, or though the war, that you encounter them all the time. In certain places you will encounter one every ten minutes. Cesca and I went to a performance by an invalided acting troop in Siem Reap and saw firsthand the mental effects and stigma of having such injuries in a country without a social service. Begging becomes their only hope. Thus, the cycle perpetuates itself. In fact, for the children at least, selling bracelets, massages and themselves on the beaches of Cambodia is a real career choice. I remember Cesca asking one little girl what she wanted to do when she was grown up. “Doctor!” came the reply. Cesca was moved enough to buy the proffered item; why not to help a girl in her ambitions? Twenty minutes later another girl came up and she wanted to be a doctor as well. So did the next one after that. It seems that “becoming a doctor” means more sales because Western people respect doctors a lot. Small things like that work on you. They gnaw. Cambodians are great people- friendly, helpful and smart. They need a break, but for now, they are broken. The US really wanted to save Laos. I say that now because this is the only redeeming quality for what they did to this country. It was akin to saving a man from robbery by shooting him in the head. In addition, official history has not been kind to them on this score- the Pathet Lao, now the government, has very subtly changed the version of events in its official histories. As far as they are concerned the US were fighting against the Laotians, not for them. Such a dichotomy partially explains the over-bombing of Laos, making it the most bombed country in the world, when in fact the truth is far worse. The US bombed the hell out of Laos to try to save it. Of all the countries to suffer from the American War, Laos is the one left with the longest legacy. The entire eastern side of the country is littered with unexploded bombs of all types. Even monstrously large B52 bombs are regularly dug up. On one video we watched they found two in the road between two schools. Both armed, both ready to blow if knocked. 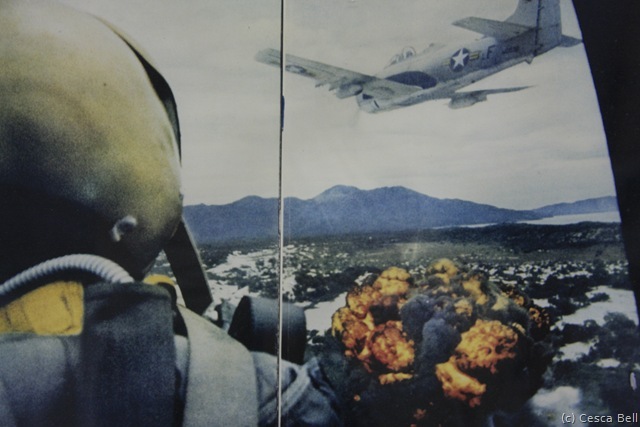 Aside from the big stuff, Laos was cluster bombed to hell and back. 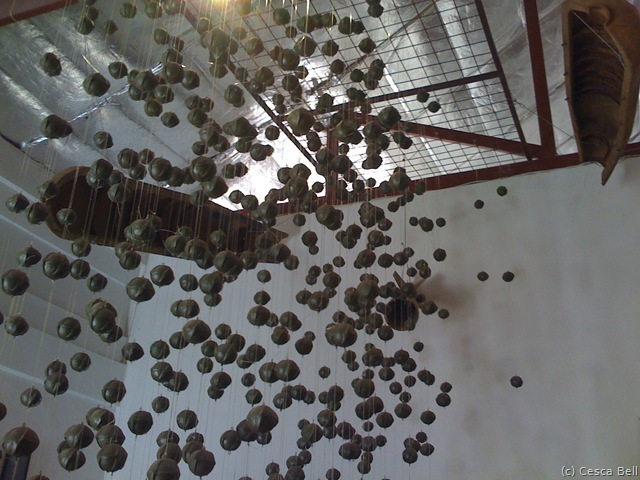 Cluster munitions, called bombies by the children of Laos, are small cricket ball sized bombs of varying types. You see, Laos is so poor that scrap metal is worth serious money. Little children all want to get the bounty on scrap and so regularly hunt for Bombies. This is too often a tale with the most tragic ending imaginable. I cannot think of anything worse than children blown to bits by cluster bombs dropped by an ally in order to protect their culture. That is exactly what happens every day here. Laos was the country that stole our hearts in SEA. It has an innocence about it that belies the fact that a fair percentage of the population is living with the threat of being blown to bits every single time they step out their door. It is testament to their innocence that they do not realise that this is not normal. Perhaps they are waking up. The government of Laos is a classic Eastern Block Communism but now with capitalist overtones. The opening of the country to international trade has started a chain reaction that will eventually lead to change, even if that change is violent. Necessity will drive it. For now Laos is a wondrous mix of countryside Asia unchanged for 100 years and French inspired food and drink. The beer in Laos is one of the very best in the entire world and in the capital you can get a brilliant steak dinner for pocket change. The simple Mekong Life – how long will it last? The visitor numbers are increasing and it will not be long before this travel trade, properly directed, will make a real difference. Much of the conversation held between backpackers is on the subject of the travel trade in Laos. 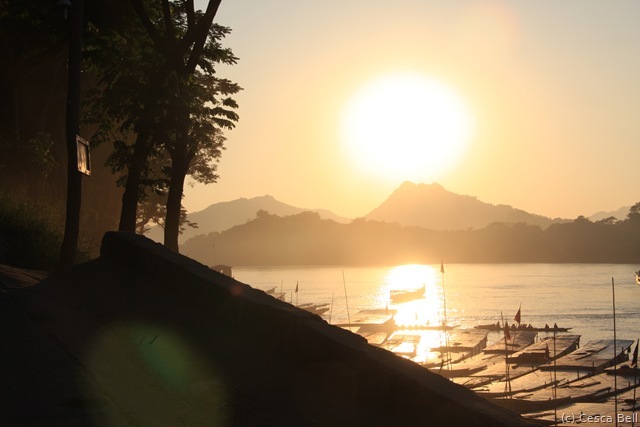 The question is, “will the money made from travel affect Laos in a good or bad way?” Already the town of Vang Vieng is given over to supplying tourists with drink, drugs, endless episodes of Friends and riverfront clubbing. 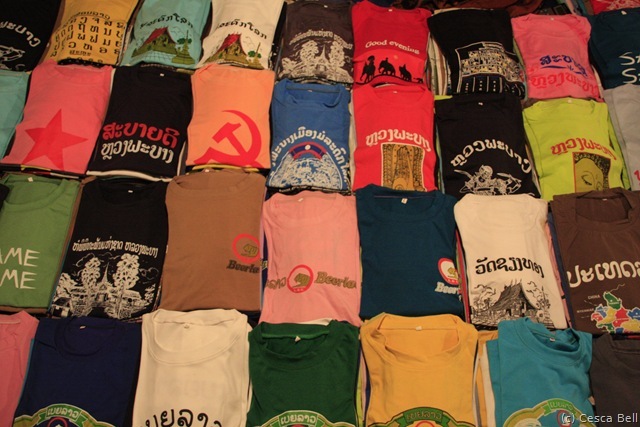 Lao T-Shirts, great but only for tourists. To those harmed by bombs it is already too late, but organisations such as MAG (Mine Action Group) are trying to de-bomb Laos by 2012. On our visit to their headquarters, they showed us a computer drawn map of the amount of Unexploded Ordinance in Laos. Each bomb sortie was a red dot. The entire eastern side of the country was red with so many dots that they all blended together. You can see the data yourself online using Google Earth. We donated all we could to MAG and hope they achieve their projected clear date as each year adds more misery to this already burdened country. Vietnam’s issue is not with UXO’s – although they do exist and like Cambodia, you should never walk off the path, nor is it to do with societal mental damage. In Vietnam, they have sorted through the American War and put the blood very firmly on the hands of the US. In Ho Chi Min City (Saigon) there is a very good museum to the war that pulls no punches to tell you what the US did to these people. However, it did not break them. The Vietnamese are proud of their achievements. Proud to have won what, was from their point of view, a war of independence. I could not help but be impressed by both their attitude to it and indeed their industrious attitude to the future. So, what is the damage here? Basho considers facing one of these monster US tanks in battle – they are scary enough when decommissioned. Two things. 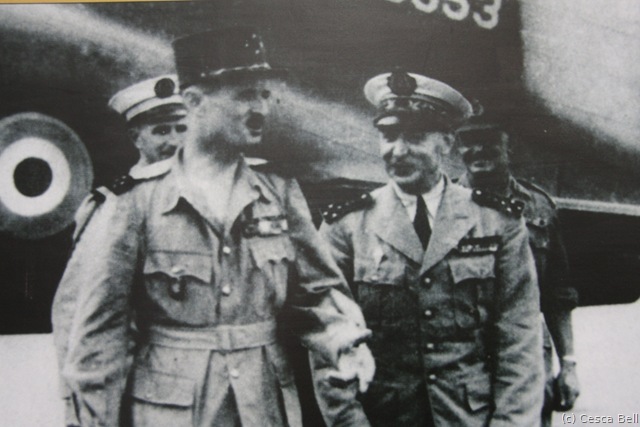 Firstly, one man you meet fought against the US, the next fought for them. This has a dividing effect on the country and while the north/south border has physically gone, the mental border is still there. Still, that is no worse than in England. The second, and far worse thing, is the way the world see’s Vietnam is through US war movies. I watched Rambo cut down multitudes of evil VC in the Rambo: Part 2 movie. I saw Platoon portray the VC as simple targets. I have seen them dehumanised repeatedly. Even the films that try and “apologise” for the war, like The Deer Hunter, shows the VC in a way that would be scorned if it were – say – the Japanese. I have seen a man in Ho Chi Min take his children for a walk to the same park every day. Feed them breakfast on the grass, play with them and watch over them. He did not fit a stereotype I was force fed all my life, he was simply a good father. This Hollywood movie misrepresentation leaves the Vietnamese with a lot of catching up to do even today. I lost count of the number of people who warned me against the Vietnamese culture. Many said that they were rude, hostile and not friendly. This malignment was quickly banished on arrival. I have to say that the Vietnamese are some of the nicest people we have yet met on our journey and all through the country the same smiling faces greeted us. We felt very welcome, even when chatting to a man who had lost his arm during the war. They are proud of the war. Such wounds are worn with pride here. The modern Tet celebration has a real buz about it. It is everyone’s birthday, the New Year and the “surge that changed the war” all rolled into one. 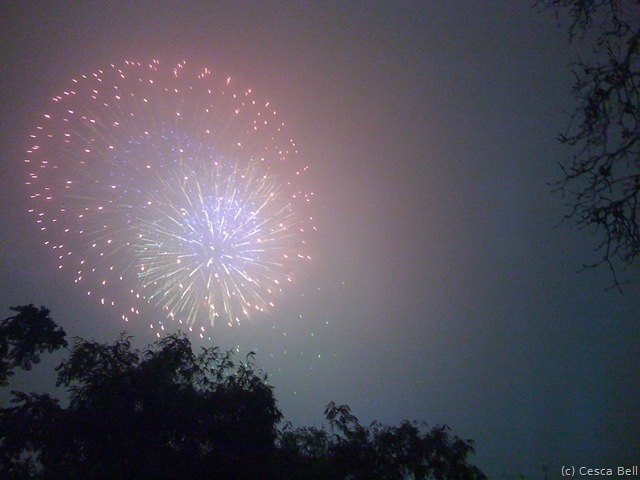 Great fireworks. In 50 years time, will we be writing posts like this about Iraq? The amount chaos left in South East Asia is truly tragic. Death and destruction to prevent a theory, a theory that said if SEA falls to the “commies” that “western” people may be next. The real fear the US had was a fear of about its own societal core, it is after all a very young country and such upheavals always seem more possible. It is no gratification that the US even turned on its own people to flush out possible communists with the advent of the “Reds under the bed” and McCarthyism. It is, I guess, just another part of the tragedy of the American War in South East Asia. Where the note is marked “(WIKI)”, it is linked to Wikipedia. Note that this brilliant website is not the be all and end all of factual information on anything. It is, however, a very good place to start. 1. French Indochina (WIKI) and Flashman and the Great Game. 2. Quote by Basho’s Nan when describing the war to Basho as a kid. 3. 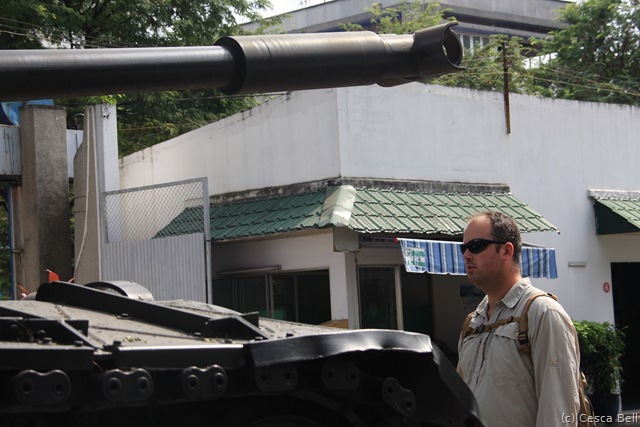 Visit to the river Kwai and the Australian War Museums near Hells Pass. 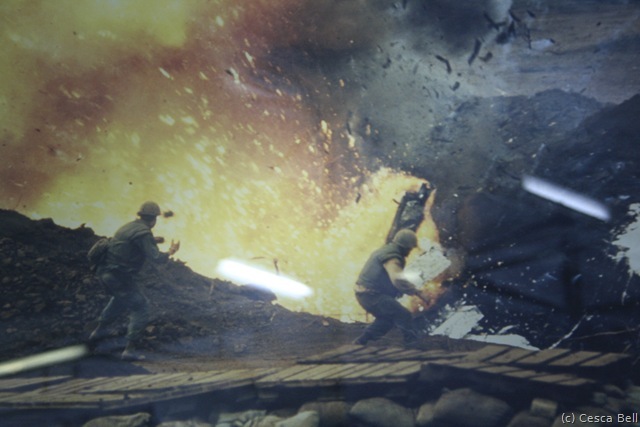 5.Battle of Dien Bien Phu (WIKI) – Also note that this battle was not quite the massacre the cinema has later claimed, but the French did get a serious hammering and the VC realised that in a straight fight they could sometimes win. 6. Visit to the China Expedition in Singapore’s Museum of Humanity. 9. Documentary footage from film shown in Siem Reap’s Night Market. 12. 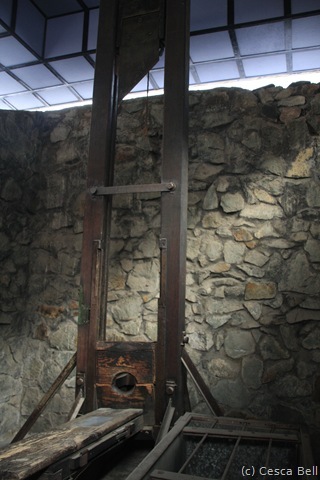 I have seen the actual Guillotine in the War Remnants Museum in HCM City. 14. Contrary to the famous movie on this shooting, it was very possible and actually quite easy to get all the shots off from Oswald’s rifle. I have seen a documentary that shows this. 15. The whole mess of the Gulf of Tonkin is one that was only cleared up in 2005 when the NSA published what happened. In the “The Fog of War” documentary, then US Defence Secretary, Robert Mcnamara admitted that he received differing reports. The upshot is that the incident gave an excellent pretext to war. 20. The data on the bombing runs is available on Google Earth; I was shown this data at MAG in Vientiane and taken through what it meant. 21. “”We are beginning to win this struggle” asserted Vice President Hubert H. Humphrey on NBC‘s “Today Show” in mid-November” (WIKI) and Westmoreland, William C. A Soldier Reports. New York: Doubleday. I read this in a book shop in Seim Reap. 22. Tour guide at Cu Chi tunnels, Lonely Planet Laos and Wikipedia. 27. The king of Cambodia at this point supported the Khmer, once he realised what they were really like he changed his mind. On video footage I saw, he was very tearful on the subject. 30. Visit to S21. We met one of the hand full of survivors when there, it was a good feeling to shake his hand. 32. This is claimed by the Vietnamese, as the southern part of the country – the Mekong Delta – was originally Cambodian and shares much common ground with them even now (such as their flavour of Buddhism being Theravada when the Vietnamese are Mahayana). 36. 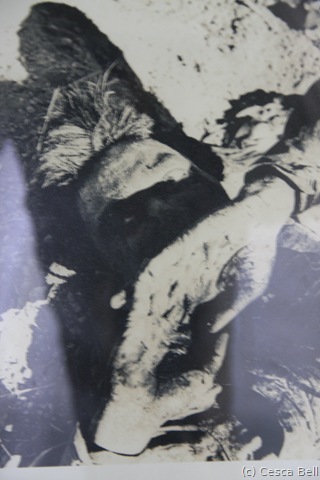 Photo evidence in the War Remnants Museum.